"A quick, easy and delicious way to use the otherwise unused portion of chard. Use whatever type of pasta you'd like. Garlic can be substituted for garlic scapes. 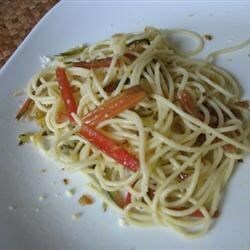 Serve with shredded Parmesan cheese." Bring a large pot of lightly salted water to a rolling boil. Cook the Swiss chard stems in boiling water until tender, 10 to 15 minutes; drain and rinse with cold water. Set aside. Bring a separate large pot of lightly salted water to a rolling boil. Cook the vermicelli pasta in boiling water until tender yet firm to the bite, 4 to 5 minutes; drain. Meanwhile, melt the butter with the olive oil in a large skillet over medium heat; stir in the onion and garlic scapes. Cook and stir until the onion is soft and translucent, about 5 minutes. Increase heat to medium-high, stir in the chard stalks, and cook until the onion has browned, about 5 minutes more. Season with salt and pepper; stir in the cooked pasta to serve. See how to make a garlicky broccoli sauce for angel hair pasta. A great, simple pasta dish! I substituted 3 green onions for the 1 large onion and added 2 sprigs of kale. Delicious and light! Wonderful and easy to make. Yum! I messed this recipe up and used all of the Swiss chard and not just the stalks. It was still very very good. My husband also liked it.